Cast on loosely a multiple of 3 sts, + 2. Set up row: P2, * sl 1 yof, p2; repeat from * to end. Row 1 - wrong side: K2, * yf sl 2 yo, k2; repeat from * to end. Row 2- right side: P2, * sl 3 yof, p2; repeat from * to end. Row 3: K1, yf sl 1 yo, * brk 1, (yf sl 1 yo) twice; repeat from *; ending last repeat with k1. Repeat rows 1 to 4. Ending with row 3. Next row (befor bind off): K2, * brk 1, k2; repeat from * to end. Sl1yof: Slip 1, yarnover, yarn to front. With working yarn in front, slip the next stitch purlwise, then bring the yarn over the needle (and over the slipped stitch) then back to the front and under the needle in position to purl the following stitch. Yf sl1yo: Yarn forward, slip 1 purlwise, yarnover. Bing the working yarn under the needle to the front of the work, slip the next stitch purlwise, then bring the yarn over the needle (and over the slipped stitch) to the back in position to work the following stitch. Brk: Brioche knit - also known as a bark. 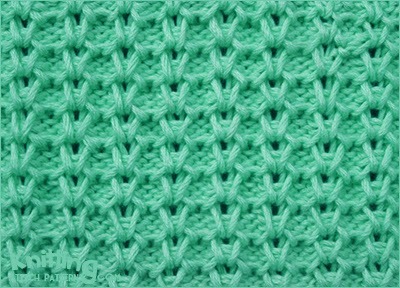 Knit the stitch (which was slipped in the row before) together with 4 yarn overs. Brp: Brioche purl - also known as a burp. Purl the stitch (which was slipped in the row before) together with its yarn over.